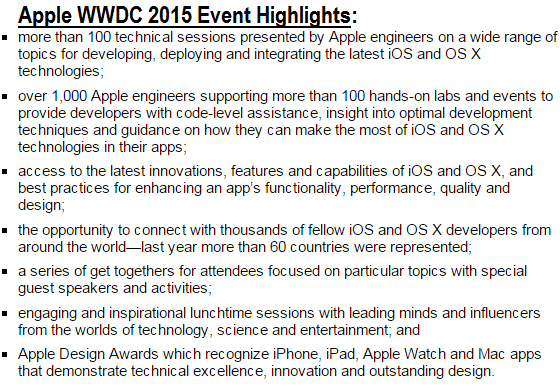 Apple's big annual event named WWDC 2015 date has been officially announced by Apple i.e. From Monday, June 8th, 2015 to Friday, June 12th, 2015 at San Francisco’s Moscone West, USA. Apple's 26th World Wide Developer Conference 2015 will be based on five-day conference sessions with aimed to glimpse into the future of iOS Firmware and OS X Software i.e. iOS 9 for iPhone, iPad and iPod Touch and OS X 10.11 for Mac. Apple's WWDC 2015 ticket registrations are open at the WWDC website from Friday, April 17th, 2015 at 10am PDT. WWDC 2015 attendees will be finalized through random selection process. Those who don't want to attend the event personally can watch the full WWDC 2015 Updates and Announcements coverage details live at the WWDC website and also through the official WWDC App available for the iPhone, iPad and iPod Touch. WWDC 2015 Keynote Live Video Streaming will be available on Monday, June 8th, 2015.